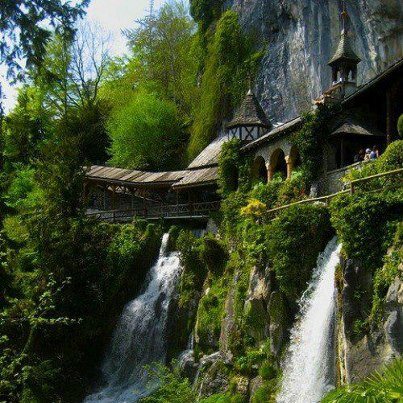 The St. Beatus Caves are an extensive cave network located in the Switzerland near the village of Beatenberg, above Lake Thun. Saint Beatus of Lungern took up hermitage near the entrance of the cave system, probably in the ninth century. Legend holds that Beatus fought and defeated a dragon who lived in the caves. Saint Beatus' grave is located between the monastery and the cave entrance. An Augustinian monastery was established near the mouth of the caves. Today, approximately one kilometer of the cave system has been opened and illuminated for tourist access; the monastery site is now occupied by a restaurant and gift shop.